The most astonishing and surprising thing I find about Washington DC today is the contrast in mood between DC today and what DC was thinking a generation ago, in 1983, the last time the unemployment rate was kissing 10%. 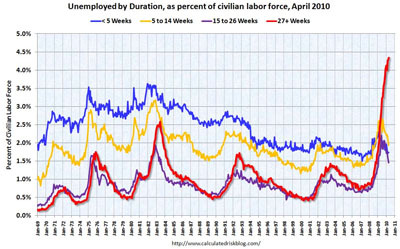 Back then it was a genuine national emergency that unemployment was so high — real policies like massive monetary ease and the eruption of the Reagan deficits were put in place to reduce unemployment quickly, and everybody whose policies wouldn’t have much of an effect on jobs was nevertheless claiming that their projects were the magic unemployment-reducing bullet. Today…. nobody much in DC seems to care. A decade of widening wealth inequality that has created a chattering class of reporters, pundits, and lobbyists who have no connection with mainstream America? The collapse of the union movement and thus of the political voice of America’s sellers of labor power? I don’t know what the cause is. But it does astonish me. I think there are two distinct issues here. The first is the government response to high unemployment, and on that score I think we’re doing as much as (or more than) we did in 1983. Interest rates are at zero, the Fed has vastly expanded its balance sheet, a $700 billion stimulus bill has been passed, and federal deficits are around 10% of GDP. That’s a stronger response than we had in 1983, when real interest rates were around 5% (and rising) and the federal government was running a deficit of around 6% of GDP. not so much. It’s not that coverage of unemployment is absent, just that it strikes me as much less urgent than it was in the early 80s. I don’t know why. Maybe Brad’s reasons are the right ones. Maybe it’s just been crowded out by other financial news like bank bailouts and subprime ghost towns. Maybe the social safety net is more effective now than it was 30 years ago. Maybe it has something to do with the fact that today’s stubbornly high numbers are concentrated among the long-term unemployed, as shown in the chart on the right. Maybe the rise of two-earner families has reduced the pain of unemployment somewhat. Maybe nobody really believes any longer that the government can do anything about this, so it’s not worth reporting on. I don’t know. But like Brad, it strikes me as quite odd.